My coleader and I started with great intentions. Fourth grade would be journey year. Fifth grade would be Bronze Award. 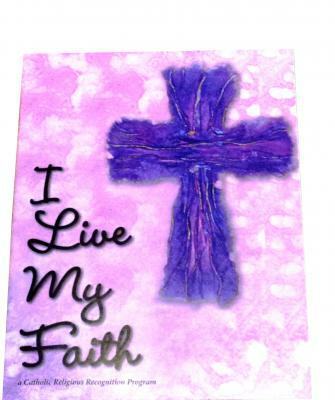 Sixth grade we would tackle the I Live My Faith religious award for Catholic Girl Scouts in grades 4-6. And reality happened. My Girl Scout troop became jocks and chose travel teams over scouts. I was left with a small troop but started to rebuild with other middle school scouts from neighboring schools. The award book sat in my Girl Scout area all through the fifth grade year, a reminder of ideas gone by. I decided we’d let our girls choose whether to earn the award on their own, versus a troop thing as we did in Brownie years. And as the mix of my troop changed, I’m glad I made that choice. I secretly hoped my daughter would take the journey and decide to work on her religious award. After going through some difficult years with bullying, I saw the religious award process as a way to reconnect herself spirituality and rebuild. The options to tie in her faith through artistic outlets would be a natural outlet for her. I asked her at the beginning of the summer if she’d like to work on the I Live My Faith award, and after thumbing through the book, she agreed. The first several steps of the 20 or so requirements were ticked off. And them she stalled. And I waited. And waited. And waited. Summer ended, with little progress. Suddenly everything was more appealing than doing the book. Like making the bed. It wasn’t that the activities were hard or pushed the wrong buttons. For my daughter, who struggles with some executive functions, getting going was hellish. We perservered. Through downtime at play practices, losing her sheets of papers more times than I could count (at least it wasn’t just school), through tiredness. October came and our diocesan deadline approached. It took sitting down and reviewing how far she had come with the activities and how close she was top finishing the award that finally got her going. Weekend by weekend, we would nibble off a step or two. Want screen time? Show me an activity or talk through what you did. As she went through the award requirements step by step, she could see her achievements, and more importantly, her contributions in her faith journey. Put a prayer to music? She talked excitedly about how she and other leaders in the Little Flowers group at our church did just that. Create artwork of the sacraments? She blew me away with the Worrell she did in middle school art. Lead others in service? She recalled helping at a neighborhood Vacation Bible School. And the conversations we had about how I lived out elements of my faith? Amazing to share with her. I don’t know that she would have necessarily listened otherwise, or that I would have opened that conversation. Making my daughter complete the award once she started it wasn’t easy. It would have been all too easy to not worry about it, to set it aside. It was one more thing in a growing list of activities. But we stuck it out. Tonight, she finished her final element of her I Live My Faith award. 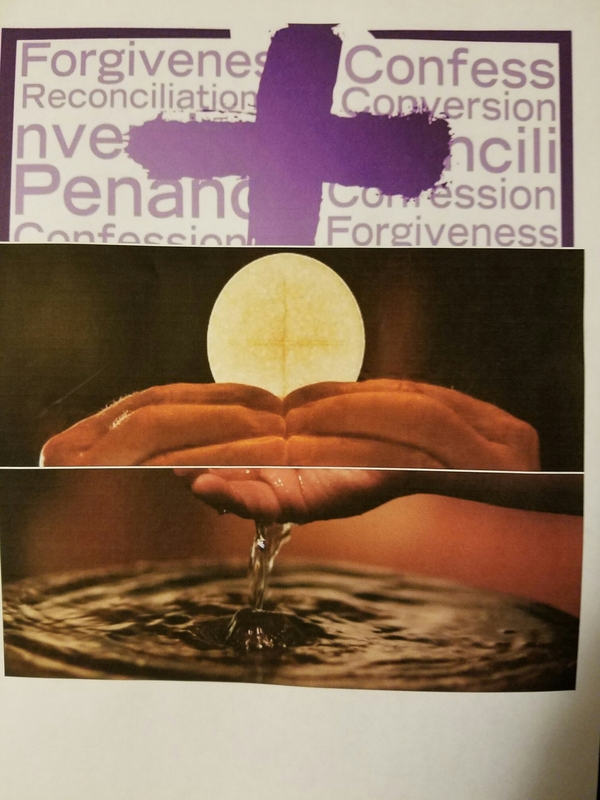 She created a digital collage of the sacraments she has earned. I think the imagery she selected says it all. Being an active participant, not just lazily checking off a list, is what our faith journey is about. No one, no matter your faith tradition, has promised the path to be easy. I’m so glad my daughter took the chance and I was there for this small part of the way. Next Help Our Girls Get to the National Convention! I didn’t know Girl Scouts had a live by faith award. That’s awesome. Heather, there is a interdemonational My Promise My Faith pin that any Girl Scout can earn. That ties the Girl Scout Promise into the threads of individual faith practice. Some Christian denominations, and I think some others as well, also offer more customized awards based on their faith practices and values. Sounds to me like she’s growing by leaps and bounds! What a great and poignant journey for you and your daughter. Thanks for sharing. I’m a Tenderheart leader for my daughter’s American Heritage Girl group. I love it. Your blog post blessed me. It reminded me to keep on persevering in my kid’s faith and scouting journey. That is a lovely and inspiring story of great parenting and leadership. How wonderful! Love that she decided to do it and worked towards it. It is so much more meaningful that way. This is a new concept to me but well done in supporting her to stick it out, I’m sure this can be applied in a variety of settings.